Bookmarks are links to websites that make it easy to get back to your favorite or important web pages. This is very handy feature in every modern browser. You can use the bookmarks to easily save the webpages. Also, you can bookmark the web link to revisit, instead of memorizing long web addresses. I have more than 3000 bookmarks in my chrome which has been collected over the last few years. This list includes movies to technology to design resources. Since chrome has shown your bookmark as an Omnibox search result, it is more useful to you to go back to the particular site again without any trouble. Like me many users have large collections of bookmarks in their browsers. Managing the huge amount of bookmark links aren’t easy. Because the list may have many duplicate links, and over the years the site may be down, or the web link may be removed. To maintain your bookmark list without duplicate and up to date links, Chrome has one Extension called “Bookmark Sentry”. 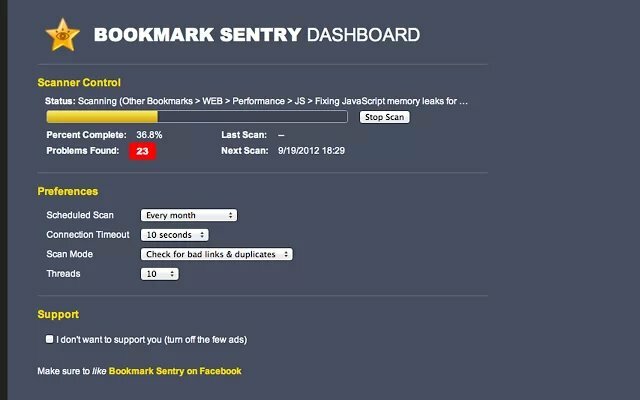 This Bookmark Sentry (Scanner) simply scans your Google Chrome bookmarks for bad links and duplicates links. This extension displays a report if it finds bad links. Using that report, remove the duplicate bookmarks using this tool effectively. It can be scheduled to run a scan every couple of days or not at all. It’s kind of like Firefox’s “Check Places”. Just install this BookMark sentry from Google Web store in chrome. There will be no icon for this extension in Address bar. So that you have to Go to Tools > Extensions > Bookmark Sentry > options to open this handy tool. Choose the appropriate options you want or simply click the “scan now” button. It simply scans your duplicate link ,404 links and will create the report for them. Obviously, You can change the scan mode to only Check for Duplicate links or Bad links or both. In the report page, simply delete all 404 links and duplicate bookmarks. If you have many bookmarks in your chrome browser, use this extension to manage it. It is an essential tool for you to fix, manage and remove the duplicate bookmarks in your chrome.